Sixth in the Daisy Dalrymple mystery series. After insulting every member of his rowing team, a young titled man dies during a boat race. Daisy and her boyfriend, an inspector with Scotland Yard, sift through the clues.I think my main problem with this book is really just my problem with the sub-genre itself--I'm tired of slightly quirky characters who stumble upon mysteries in quaint English surroundings. The main character doesn't change or learn anything, and her relationships with other characters don't alter to any real degree. Usually these books are at least good for a few moments of humor, the brain puzzle of guessing whodunnit, and a little window into a historical period. But by book 6 of this series, it's all starting to wear thin. I really hope that something big happens in the next book to shake up Daisy and the comfortable groove this series has found. I had read the earlier installments of this series several years ago, and I had always meant to read more. I finally got around to it, but this book was not really worth it. The mystery is not well constructed, and the ending is rushed (both figuratively and literally--for some reason we get a wierd foot-chase scene that was really out of place). What I found most distasteful was Daisy's attitude. She kept thinking unkind thoughts about the other characters, and then only sort of regretting her meanness. I didn't remember Daisy being so unlikeable before. Since these books are short, I will give them another chance. But they better bounce back quickly. One note for me, since I've also been reading Robin Paige's Victorian Mysteries: these books take place only 30 years after Paige's, but here finger-printing and other methods of modern forensics are used regularly. In Paige's series the police look upon these methods with a lot of skepticism. The turnaround from distrust to acceptance of these techniques is interesting. There are constant references in this series to class and the advantages had by those who are fortunate enough to be in the upper classes and this book is no different. The facts are quite believable but the motives are a little strange. I know that in the twenties there were a number of people who hadn't yet learned that law applies to everyone and police who were hampered by senior officers who were subject to pressure from those people and withheld action under it but surely not everyone everywhere.I do believe the bullying of the scholarship student because we've all seen that happen, but I find the acceptance of Basil DeLancey's appalling behaviour because he was a good cox a bit difficult to accept, even if the others did have touches of the same prejudice against the "lower orders". If a person is subjected to constant bullying they will eventually come to believe that they really are what the bullies call them so Horace's prickliness is understandable and Miss Hopgood will have an uphill job getting him past it.All the details of the Henley Regatta were fun and enabled me to set the event geographically.I do enjoy this series and the characters and Tom now has a beautiful blue and white checked summer suit. Wow! They are intended as light reading so it's probably unfair to carp at details. Another seriously light, entertaining mystery with Daisy Dalrymple. Upper & lower class friction & the deaths of 2 truly obnoxious characters. This was a lot more fun than the previous book in this series. (One more and I'm up to date!) Alex and Daisy are engaged and are planning a weekend in the country. There is a regatta going on. Daisy is staying at her aunt's house and has a press pass. She is excited at the idea of being presented to Prince Henry as well. It is quickly obvious that the rowing team members staying at her aunt's house have some problems with the team. The cox is Bott, son of a shopkeeper and a math and science genius. He is one of the few non upper class members, most of whom treat him poorly. He has a huge chip on his shoulder as a result. (The disdain of the wealthy young men for someone whose interest lies in mathematics and science is also an interesting and amusing aside.) One of the team members is the younger son of an earl who is particularly disdainful of Bott and constantly baits him. When his body is discovered, Bott becomes a natural suspect. Daisy, however, is not convinced. Alex would rather she didn't get involved, but we all know that's NOT going to happen. Having been unable to trudge through Damsel in Distress, which seemed to have been written while the author was thinking about something else...perhaps several things...it was with some trepidation that I picked up this installment. It continues to be mental popcorn of the lightest sort, but much better than vol 5. This is the obligatory 1920s "collegiate murder" combined with the "sporting event murder", reinforcing class attitudes along the way as the most popular suspect is the second least popular character (the stiff has that dubious honour), in part because his father is a small time grocer from the wrong region. I'm sure his being intellectually brilliant and surrounded by wealthy jocks didn't help matters, either. Daisy and Alec seemed to think the Oxbridge regatta would be the perfect weekend away--which is odd, since they'd be staying in a houseful of strangers and Daisy's wealthy relatives! I finished the book last night, and while I remember who dun it, I can't for the life of me remember why! I was a bit surprised to read that "A pre-dinner sherry in the lounge with her friends, and wine with the meal, effectively drove Bott's fate from her thoughts." Oh, really? Not the conversation and companionship, not a delicious, many-course meal with her beloved--nope, for Daisy it's the booze that does it. ??? ?Dunn manages her plots and personages better this time round. I wonder why she feels the need to shoehorn in American characters with impossible names, though in this case they get only a passing mention--which is good; I was ready to cringe at the thought that her stock-character cardboard Yanks might possibly show up. However she continues to commit linguistic solecisms; this time "nookie" finds itself in the mouth of a well-brought-up bourgeoise gel who, having no brothers, one would hope had never been in a position (so to speak) to have heard it. Again, one of the constables says that someone's alibi "sounds like a load of bumf," although "bumph" or "bumf" means paperwork and/or writing paper, not nonsense or lies. A fake alibi might sound like a load of cobblers, but never "bumf." Alec speaks of "fudging" case notes, which I'm not terribly sure was 1920s slang.However, it was a quick, light read that restored my hopes of the series. It will never be as entertaining as Phryne Fisher, but then I ask too much. 3.5-4 starsI'm holding back a bit on my rating, because there were SO MANY PEOPLE in this book, it was difficult to keep everyone straight. Which made figuring out who did what more difficult, too. But I enjoyed continuing to see Daisy and Alec (Detective Chief Inspector Fletcher) interact both personally and professionally during the story.Daisy is now writing for an American magazine, and they want her to cover the Henley Royal Regatta, which includes rowing races. Daisy even has an invite to meet HRH Prince Harry (no, not the current Prince Harry, this is 1923, remember) at a reception. Daisy will bunk in at her aunt's house (her mother's sister), Aunt Cynthia. The rowing crew from Ambrose College at Oxford is also staying at Aunt Cynthia's, as well as Dottie Carrick, Daisy's cousin Tish (Patricia's) college friend. The Ambrose rowing crew will row in the 8-man with a cox and the 4-man without a cox. Tish's boyfriend, Rollo Frieth, is the team's captain, and her cousin (not Daisy's cousin) is Cherry (Erasmus) Cherrington, also on the team. Alec is expected to join Daisy for the weekend, although he'll bunk in at a local inn.But when Daisy meets the Ambrose team, she quickly finds that there are mounting tensions between Horace Bott and Basil DeLancey. Bott is the son of a shopkeeper and a scholarship student at Oxford; he's intelligent, but he's got a big chip on his shoulder. Seems Bott is excluded from much of the camaraderie and socialization of the college because he's not a gentleman. DeLancey is the youngest son of an earl, and he, especially, likes to make Bott's life hell. Daisy even thinks to herself after witnessing DeLancey push Bott into the river (Bott can't swim), that the two are likely to murder each other if something isn't done to stop them.DeLancey goads Bott into drinking too much the night before the big 8-man race, and Bott disgraces himself and his team by becoming violently ill during the race. The Ambrose 8 don't even cross the finish line, which causes DeLancey to cause a public row. His brother, the earl, Cedrick DeLancey breaks up the ruckus and forces Basil to apologize to his team, but he manages not to apologize to Bott, who's already stamped off after threatening DeLancey. Cedrick, it seems, is anxious about bad publicity; seems Ceddie was in WWI and panicked, leading his men from behind into a massacre from which there were only 3 survivors, Ceddie included. Because he was an earl's son, it was hushed up, but Cedrick lives in fear that his actions will be revealed, bringing down loads of scandal and reproach upon him and his family. But even Cedrick can't seem to rein in his younger, bratty brother Basil.Basil decides he's going to guard the 4-men skiff, thinking that Bott will sabotage it that night. No one believes that Bott will harm the skiff, but they wonder about him harming Basil. When Basil stumbles into the room that Daisy shares with Trish, he seems drunk - confused, stumbling, and staggering. Trish is terrified that Basil is trying to seduce or accost her - he's made several passes - and she's almost useless. Daisy, however, sends Trish off to get Basil's roommate to help bring him to bed.The next morning, Basil seems to be fine, despite a headache, and he even eats a large breakfast. But during the race, Basil becomes violently ill and falls out of the skiff into the water - dead. So much for Daisy and Alec's weekend plans! Because of the many jurisdictions and the river, Alec is assigned the task as Scotland Yard and being on the spot. But when they discover that Basil didn't drown and wasn't drunk, everyone is confused. Until the coroner confirms that Basil has a lump on each side of his head - he died from an internal hemorrhage, bleeding on the brain.WHO killed Basil DeLancey? Horace Bott seems the lead suspect, but Alec can't seem to rule out any of the rest of the Ambrose team or even Cedrick DeLancey, Basil's brother. When Cherry, Alec, and Daisy are out for an early morning row, they come upon a skirmish on Temple Island... shots are fired, and they discover Horace Bott face-down in the river, with a gunshot wound grazing his temple. But who shot Horace? The likely suspect is Cedrick DeLancey, because Daisy managed to see the back of the other person on Temple Island row towards and get out at the stop where he's staying. But was it Cedrick?-----------------------When the action started going, it was non-stop. But there were so many other possible angles, I wasn't satisfied with the results. I especially wasn't happy with Daisy, who managed to get a confession from the person who actually hit Basil - not meaning to kill him, but purely in self-defense. However, Daisy withholds the information, since so many other serious crimes and offenses have occurred... she doesn't tell Alec until the very last pages of the book, and poses it as a hypothetical situation. To which Alec tells her he doesn't want to know. Huh? I suppose there's nothing to be gained, but still... that disappointed me. Both that Daisy protected the party and withheld the information from Alec for so long, and Alec's reaction to it.I also wonder at the many times that Alec is so exasperated with Daisy. He's constantly thinking to himself that he can't control her actions, which to some extent I understand, since she does rather force her way into situations that can be dangerous. And she is rather nosy, and people do tend to tell her things. But it makes me wonder how they'll get along once they are married - or if they can survive the engagement? Alec knows who Daisy is, so he should be able to accept her, right? And Daisy realizes that Alec isn't always just trying to hold her back, but that he is the voice of reason when she tends to rush into danger. There should be *some* change or compromise between them, or they'll never make it.Which is why I can't give this book a 4-star rating. Sorry! One thing I love about this series is that the books are very much in the Christie “manor house murder” tradition – small, confined settings filled with memorable characters and a body or two. However, this one seemed almost a little too small – mostly because many of the characters are sort of awful people. I still like Daisy but she was less likable than usual here. Her romance plotline continues to be enjoyable…maybe both the author and I hit a little bump in the road with this one. It was more tedious than fun and I was happy to see the end of my time with these people. Book Six in the Daisy Dalrymple mystery series finds newly engaged Daisy headed to cover the Henley Regatta for an American magazine. Her fiancé Detective Inspector Alec Fletcher was to join her. True to form Daisy is only on the scene a couple of days when one of the rowers of the Oxford Rowing team is murdered. When Alec arrives on the scene expecting some romantic time with Daisy, he instead has the displeasure of being the only one qualified and available to investigate the murder.This one moves fast and has a very interesting plot. A very good addition to the series. Not one of the better Daisy Dalrymples. Confusing as to actual cause of death and not a very satisfactory end. It felt like Dunn "owed" the publisher a book and scratched this out in a hurry. Just not up to usual standards. Not my favorite of the series, but I like Daisy and Inspector Alec so much, that it was still enjoyable. The rowing/crew lingo and setting was boring at times, but I liked the characters and overall plot. This is the 7th Daisy Dalrymple mystery I have read and enjoyed. I have two more in the wings. They are not significant, but they are fun. A lot easier to get around to than Finnegan's Wake. This was fairly light fluff but mostly enjoyable. There was a plotline/trust that was much more unbelievable than the previous books. No surprises or complexities. Characters are stereotypes. Victims and perpetrators are unlikeable. This was the second book I read in this series and I think it will be the last, at least for a while. Since I started reading the Lady Daisy-series I really wanted to review one properly but somehow never got around. Now that 'Death in the Water' also happens to be the 50th book I've read this year I thought that would give me good reason to finally do one. Unfortunately it's in my opinion so far the weakest Lady Daisy-novel.It still has good moments. I like how the relationship between Daisy and Alec is portrayed, neither as all rainbows and butterflies nor any kind of forced conflicts just for the sake of some drama. You clearly see that the care for each other but neither of them can completely shake off doubts about their two very different worlds colliding. Dunn also paints a really vivid picture of the 1920s and also doesn't take her readers for completely stupid and feels the need to spell everything out for them.I fear that's everything good I can say about this book. The crime-plot was overall just mediocre and had an ending that just left me thinking 'WHAT?'. Apart from that the characters – usually one of the strengths in the Daisy-novels – just made me go 'meh'. There's the victim, Basil DeLancey, and he is a massive jerk, now murder-victims in cosy crime-novels are rarely portrayed overly sympathetic but he is taking it up to eleven. I don't think he says just one sentence where he isn't insulting somebody. He doesn't have one single redeeming quality and I really wondered why he was only killed round page 80 (which, by the way, I find a bit late for a novel that's only 250 pages) and not long before the book started. Bott, DeLancey's main bullying-victim and therefore the prime-suspect in his murder is unfortunately not much more likeable. He's not mean, but just really terribly stupid. He takes every single bait DeLancey throws at him and then whines about how mean everybody is. He also more or less accuses Daisy of disliking him because he isn't upper-class before she said one word to him. Then, after DeLancey's murder he seems to be ticking off a list 'How to make me look really suspicious if I'm involved in a murder'Of course I never wanted him to be wrongly accused of a crime he didn't commit but it's just hard to feel sympathy for somebody if every time he screams about being wrongly accused I think 'Well, you did basically everything to make you suspicious, except painting bloody arrows, leading to your room. 'The other side-characters suffer from something that also happened in the previous Daisy-novels but wasn't as significant then. Somehow the author feels the need to introduce always all characters at once, it's always a bit strange if just one character after the other comes to Daisy and introduces him/herself including their back-story but so far I could life with it. Also because the characters were easy to tell apart, they were all ages, men and women, different jobs, etc. Here all the side-characters are students who are in a rowing-team (and their girlfriends). Once I had managed to remember who was who the book was already over.All in all, I was quite disappointed and hope Daisy will be back to normal again in the next book. #6 in the Honorable Daisy Dalrymple, magazine writer and heiress (no inheritance due to British entailed system) mystery series. 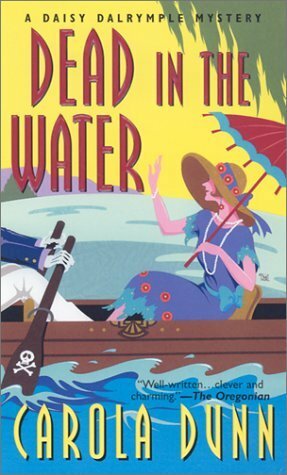 It is July, 1923 and Daisy travels to Henley-on-Thameson to write a story for an American magazine about the intercollegiate rowing events of the Thames Regatta, and hoping to spend a quiet weekend with her fiance, Scotland Yard Detective Chief Inspector Alec Fletcher, but things go awry when a murder occurs on her cousin's rowing team. A theme here is about an aristocrat who is cruel and arrogant to people outside his social class causing a lot of hostility. The honorable Daisy Dalrymple is visiting her aunt and uncle. She is there to watch the college rowing races in order to write an article for an American Magazine about the races. She has invited her fiance Detective Alex Fletcher of Scotland Yard. She hopes to spend a quiet weekend with him. She bunks in with her cousin since all the bedrooms are being used by the young collegiate rowers.We have the rowers and the coxswain Ambrose Botts. Ambrose is quite smart, but he comes from the lower class. The only reason he was able to get into college is because of his academic achievements. Ambrose is offered a scholarship. His fellow classmates come mainly from the upper class and money When he is picked as coxswain the other young men on the team are not that happy but keep it to themselves. However, one rower Basil Delancy does not keep quiet. He constantly harasses Botts about everything Especially, Botts attending school on a scholarship.As the story proceeds Delancy, who is the son of a Barron, causes much tension on the entire rowing team, yet the other rowers refuse to back up Botts for fear they will become DeLancy's next victims.Daisy is watching all of this interaction. She feels sorry for Botts. Unfortunately, Botts, being very resentful of the treatment he receives. lashes out verbally against the world. Daisy is just happy Alex is coming so they can have some private time together. About the time Alex arrives tragedy strikes. Alex is asked to help in the investigation. Daisy, of course, gets involved despite Alex objections. Daisy Dalrymple is a young lady I enjoy reading about, especially her relationship with her mother and the Detective. I find these books full of interest with the furniture and surroundings of the areas in which she works in the Victorian era very well maintained throughout.Cleverly put together stories and not always copying authors that have been before her, which I find very good.These are what I call 'easy reads' as they are not too challenging and are easy to follow the plot. So, just to recap: this is a cozy mystery series starring Daisy Dalrymple, a journalist and reluctant aristocrat, and her eventual husband Alec Fletcher, a Scotland Yard inspector. They fight crime, and also fall in love and have a very strong relationship, and fight with each other and make up (including one very frustrating moment in book 7, which we'll get to, in which the only person who spoke any sense was the nine-year-old), and are generally very charming and sweet together. I love them.Dead in the Water, or, the one with the regatta and a LOT of Daisy's family. Not, thankfully, her mother.Daisy goes out to cover a regatta, visit some relatives, and have Alec meet said relatives, and I get the general feeling that they were using this as an excuse to have a quiet weekend together. Since this is a mystery, it doesn't work out like that. There's one particular rower Daisy meets, to whom her immediate response is "ew" and "DID I MENTION MY FIANCE," and he promptly dies in the middle of a race after some shenanigans involving other members of the rowing crew and Daisy's cousin (and inadvertently Daisy). There's a twist at the end of this one that I didn't particularly enjoy-- I thought it really confused the rest of the book-- but the rest of it was actually rather cute. It’s the summer of 1923 in Henley-on-the-Thames, and young reporter Daisy Dalrymple is covering the Henley Royal Regatta. It isn’t long before Daisy witnesses conflict among the eight-member rowing team staying at her aunt’s house. Still, she’s shocked when one of the team members is killed. Since her fiancé, Detective Chief Inspector Alec Fletcher, had intended to spend the weekend with Daisy anyway, it’s only natural that he look into things. The local constabulary isn’t qualified and, with Scotland Yard’s permission, Alec is quickly put in charge.Dead in the Water is one of several books in this popular series, but this is a first Dalrymple novel for me. There are plenty of things to like about this book. Daisy is a delightful character, and as often happens in British mysteries from this period, class issues are explored.Unfortunately, it was pretty easy to figure out who the murderer was. Although there were moments of tension, the final confrontation between Alex and the killer fell rather flat. In fact, the scene read more like a sketch than a suspenseful resolution, which is a shame. Still, true cozy mystery lovers will appreciate the lack of violence and the romance between Daisy and Alec. In the late 1920s, Daisy Dalrymple is staying at her aunt and uncle's capacious country house in order to watch the boat races at Henley. The house is full to the gills with the Ambrose College crew, so Daisy's fiance, Detective Chief Inspector Alec Fletcher of Scotland Yard, will have to stay in town. Despite the lovely weather and setting, tensions are running high in the crew. The cox, Bott, is a brilliant scholarship man with a surly attitude brought on by years of humiliation and condescension from the upper crust. One of the oarsmen, Delancey, has the nastiest tongue Daisy has ever come across, and entirely directed at Bott. She's still surprised when one of them ends up dead in the water, but is the other really responsible? Alec must set aside his holiday once again to step in, but of course Daisy is there first.I enjoyed this one, even though the mystery is pretty straightforward (I prefer the Christie type where you don't really know until the last few pages). The setting is perfect for a cozy British mystery, and well-described as always. This is just a fun series. I read this book right after nr. 5 in the series, "Damsel in Distress", where the Honourable Daisy Dalrymple and Alec Fletcher of Scotland Yard celebrate their engagement at a big party, on the last page of the book. It was a little bit frustrating that the author in this book, backs up 14 days, till right after the kidnapping case in the previous book, to set the stage for this mystery. It was not believable and irritating. This said, it still was an exciting book if one counts away that I personally have absolutely no knowledge at all of rowing. I got utterly lost in the technicalities of the sport, the rules and what the boats look like. There were also too many people running around and when the final chase took place, all men trying to catch "the murderer", I was completely lost in staircases, bushes and you name it. This book would definitely do better on screen than in written form. I hope the next book will contain less motion! Reviewing on two levels for Blackston Audio's release of this 6th in series of Daisy Dalrymple mysteries.As I've come to recognize, Blackstone's quality offers seamless listening with volume well modulated and without interruption.What I found unfortunate was the story itself. Vast number of characters, indistinguishable in the narration, and forgettable in the story's duration, made for increasing confusion in following the action. I was left with a sense of displeasure with Miss Dalrymple's actions toward her fiance, Alec Fletcher, Scotland Yard Detective Inspector, at the witholding of evidence which left me questioning her character.As others in the series have provided pleasurable dramatic listening, I am hoping this is a one off. I'll look forward to another entry in the series as available. *Appreciation to Blackstone Audio for providing an audio for listening and reviewing without cost or obligation. I picked this up in a charity shop on a recent trip to the UK, and didn't notice (or I hadn't already bought) that it is a Daisy Dalrymple Mystery.I've recently reviewed Death on the Flying Scotsman which I bought as my Kindle offer of the day for 99ct (I love that offer of the day, I have tried a lot of new writers) so when I needed a bedtime read this was an easy decision.Not much to say except that the writing is lovely (lots of use of "spiffing" and "topping") and it harks back to a gentle world (that, admittedly, didn't apply to most people and was horribly judgemental and exclusive) the mystery is just mysterious enough to keep interest and Daisy and Alec's romance has now progressed to engagement (i really must go back and read the other books in order)Highly recomended as a bed-time read, holiday read, on a plane, train or whatever.